For literacy, we examined Static Images. Static Images are photos that do not move. They can be signs, posters, paintings or any visual object that doesn't move.After investigating a few images, we were given a task to choose our own static image and answer the following questions. Describe what the photo is about. This photo is about pandas, the background has bamboo trees laying on the ground. How does the photo make you feel? 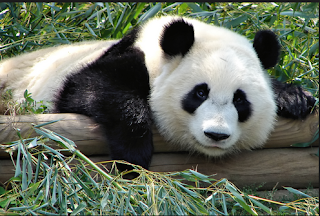 This photo made me feel sad because of Pandas are endangered because we are cutting down their forests, resulting with pandas dying along with the forests. 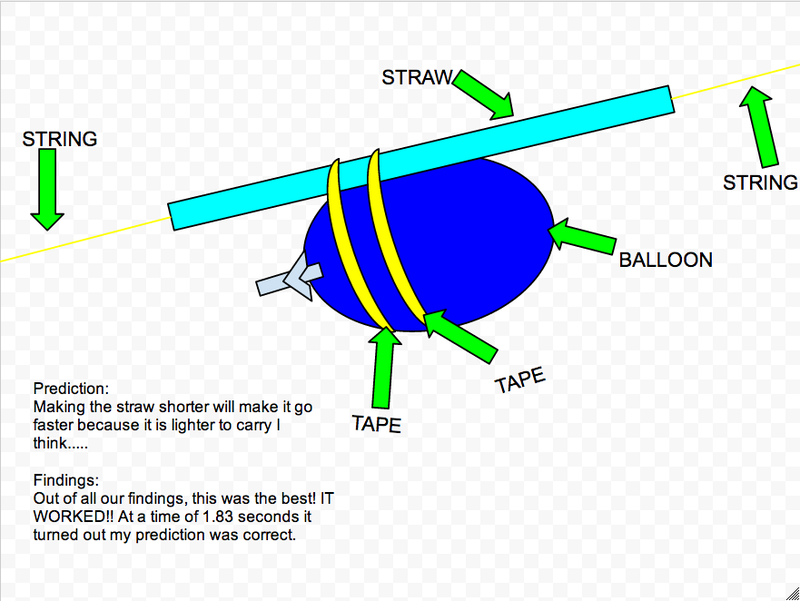 In Term 2, the Extension Group did an interesting investigation involving a string, a ballon, tape and a straw. We had a little experiment and tested our theories and see if our predictions were correct. 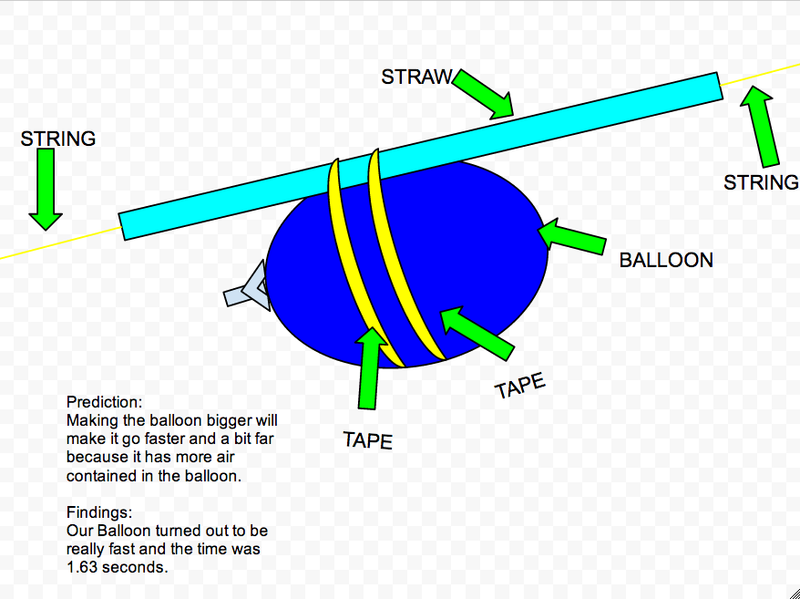 This was called the Thrust Investigation. We blew up the ballon and attached it to the straw with tape. 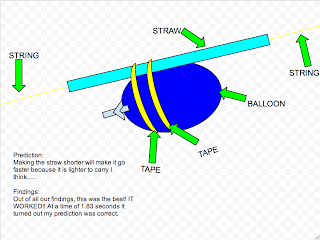 The string was inside the straw and was tied on one end of the classroom and on the other side too. Mrs Tele'a timed each of our experiments to see if our changes really did a difference with the speed. We did this three times. The first one, everyone had the same exact thing. The second one, we changed it up a bit and that was the same with the third one. Extension I Wonder School from Team 5 PES on Vimeo. A while ago in Extension we thought about everyday things that we do in our lives and we wondered about how these things were created/invented or how they were established. Kaycee and I wondered "Who invented school. When? Why? What?" And so here is a movie we both created to explain our findings. Quziyah and I created this Educreations explaining how we solved another one of Miss King's Maths questions that was apart of the Maths Challenge. Quziyah explains everything in this short animation so hope you like it. Anne and Michael each have goats. Michael says to Anne : "If you give me one of your goats, I will have double of what you will have remaining". Anne replies :"If you give me one of your goats, we will have exactly the same number of goats". How many goats do Anne and Michael have? As you can see, I incorporated the goats as M n Ms. For this question, Quziyah and I found out the answer was 7 and 5. If Michael gives one M n M to Anne, they both have 6, then if Anne gives one M n M to Michael then he will have double the amount of goats than Anne. Petals around the rose from Team 5 PES on Vimeo. Once again, this is apart of the Challenge Miss King gave us. This is called Petals Around the Rose, I mistakeingly said Roses around the Petals. Hopefully, you get it and understand this. e pa ana ki tenei wananga. Therefore greetings once, greetings twice, greetings again to us all. Poi from Team 5 PES on Vimeo. Here is another maths problem from the challenege we were given from Miss King. Here was the question: Tui is making poi for the kapahaka. She need .68 metres of material to plait for each of cords. She needs to make 26 poi. She has 18m of cord. Has she got enough?. This is our answer to it. Tristan Pang is 12 years old and believe it or not, he’s going to university next year! I know right, a 12 year old! He studies and learns constantly at home, he says it’s more fun than computer games. But we’d begged to differ. I think he really taught me something. He said that ‘Quest is fun so be nosy’. Science and maths are his strongest subjects but he’s really good at everything. Mosa Mafileo was an amazing speaker too. He is a politician and works for the mayor of Auckland. He was really funny and I could actually relate to him. Just like the other speakers, he told about his dreams and aspirations. ‘Chase your dream, Catch your dream’ he said. What was also really cool was that he was Tongan and statistics say that polynesians have a low chance of success but look at him now! I really don’t know what I want to be when I’m older, I’ve always jumped from one thing to another. Although, writing is what I’m good at and I need to work on that more. Do more of what you’re awesome at and I’m pretty awesome at writing. Another thing I’d like to do when I’m older is be a veterinarian or doctor. Miss King gave the whole class a challenge and this was apart of the challenge, we had to turn this triangle around 180 degrees by only moving 3 of the golf balls (in this case, it was circles). This is how I did it. It is just a short movie showing what I moved. Sorry if the movie isn't very explanatory. But I can say that I moved all the corners. Daniel held his torch up to his chest as he walked through the misty, gloomy forest. All he could hear was the rustling of bushes and the whistling of the wind. "Vicky!" Daniel cried nervously. Weirdly, he thought he saw his sister walk into the woods so he followed her. Although, he really wanted to get out of there as soon as possible. "Help mee". Suddenly, Dan heard a whisper, he could feel someone or something breathing down his shoulder. A shiver down his spine. Afraid to find out what was standing behind him, he slowly turned around to see nothing there. "Strange" Dan breathed. Continuing with his search, Dan watched the trees waving, creating shadows on his torch light. Who was whispering? Where did it come from? Questions were flooding into Daniel's mind. Stuck in his thoughts, Dan accidentally trips. Staggering onto his knees, his torch skids across the gravel path way. "Arghh" he whines, dusting himself off. Grabbing his torch, Dan tried to turn it on again but it wasn't working. The torch flickered as Dan switched it off and on. Finally, it turned on and Dan faced the light to in front of him. "What are you doing here?" Dan jumped, surprised to see someone here in the night. The man's voice was incredibly deep and his glare was petrifying as if he was staring right into your soul. "Uh, I'm looking for my sister, Vicky" Dan stuttered. "You shouldn't be here" the man replied. Confused Dan watched as the man revealed he was holding an blood smeared axe. Immediately, Dan ran for his life. He dodged bushes and trees, running into the wilderness. "Keep running, don't look back". Dan heard another whisper in his ear. The voice sounded a lot like the one who whispered before and a lot like....Vicky. "Vicky?!" Dan yelped, running through some thorns. "Keep running" the voice said back. Obeying the voice, he kept sprinting. He could hear the man behind him, cutting through branches. Out of the forest, Dan ran out, breaking free from thickets. "What's happening? Why is this happening?" Dan said trying to catch his breath. Then Dan looked up to see a road. "Dan, you can no longer save me but you can save yourself. This is your chance" Dan was certain it was Vicky now. He burst into tears and looked back at the forest. "You followed me into that forest and searched for me but you were in trouble" Vicky told him. "Go! Someone will find my body, but for now.......RUN" Vicky's last words echoed in Dan's ears. He dropped his torch and made a run for it down the road. Tears rushing down his face, he closed his eyes and missed his sister already. "Bye Sis" he whispered back.